Ramstein’s Family Advocacy Program has teamed up with the Army’s Family Advocacy Program team to strengthen the means of promoting an emotionally healthy household around the KMC. The joint advocacy’s program offers classes to improve family dynamics and ease potential problems that life can create for a household. “Our goal is to ensure that every military member and family has the opportunity and skills available to them to be the best that they can be,” said Maj. Ellen Wirtz, 86th Medical Operations Squadron family advocacy officer. strengthen the means of promoting an emotionally healthy household. Both advocacy programs offer classes to improve family dynamics and ease potential problems that life can create for a household. Air Force and Army family advocates have joined forces in the KMC area to allow the widest dissemination possible for opportunities and classes that they provide. A road to bettering one’s self can be difficult. However, the Family Advocacy Program will always match the efforts of those trying, Schott said. 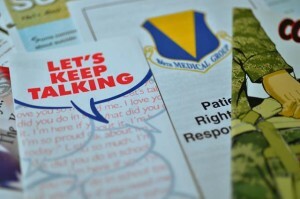 Ramstein’s advocacy program aims to create healthy relationships and families. They continue to attempt to spread their resources out as far as possible to achieve that goal. “We want to ensure that we are sharing our resources,” Wirtz said. By pooling both programs, the Air Force and the Army are able to cover the same topics without competing against each other for audience size while being able to prevent elongated stretches of times without classes. To contact Ramstein’s Family Advocacy Program, call 479-2370 or 06371-46-2370. To reach the Army’s Family Advocacy Program, call 493-4331 or 0631-3406-4331.